An extremely spectacular vine that just loves showing off throughout the year in our tropical heat! When in full bloom, this beauty will be dramatically covered with large trusses of tricolored flowers that are very showy and truly a traffic stopper. Similar to another tricolor beauty, Brunfelsia calycina, the gorgeous flowers of Rangoon Creeper open white, change to pink, then bright red over a 2-3 day period. Simply remarkable, you get to see the 3 distinct colours altogether as the vine is a constant bloomer! I’ve always been very attracted to this vine and many a time, I’m so tempted to get one. My beloved half however, would always turn down my request, saying that we just don’t have a good support to carry its heavy load. Wouldn’t a chainlink fence suffice? Well, you won’t know unless you try, right? Now, having researched for more insights about this vine and knowing that the flowers are sweetly scented, I’m further enticed to add it to our garden. It will be a lovely replacement for our Shower of Golden Climber that rarely blooms. I can already visualize it being draped over our chain-link fence with its attractive flower clusters and glorious fragrance. Hmm…keeping my fingers crossed that John will soon buckle under. Etymology: Quisqualis translated from Latin, means What is that?. Read further about Quisqualis here. Origin: Burma, Peninsula Malaysia, New Guinea and the Philippine Islands. Features: Quisqualis indica, of the genus Quisqualis, is an exceptionally impressive tropical vine, with a few varieties, distinguishable by its flower colour and leaf size. It can reach 21 m in the wild, but generally its length in cultivation ranges between 2-9 m. A large, woody and shrubby climber over pergolas, trellises, etc. and yet can be trained as a specimen shrub. 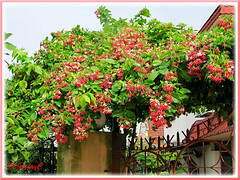 It is an evergreen (in the tropics) and rambunctious vine, free branching and vigorous-growing, needing sturdy support. Under good growing conditions, it’s typically seen with lush and fresh green foliage on cascading branches with numerous axillary and terminal drooping racemose inflorescence that is simply spectacular. Leaves with distinct venation, are oblong to elliptic, 7-15 cm in length, with acuminate tip and rounded base. They are simple and opposite. 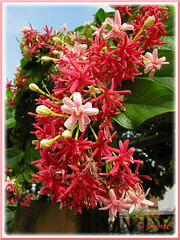 It blooms profusely and non-stop too, all year round in the tropics. 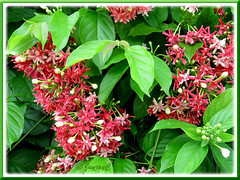 The original Rangoon Creeper with thorny stems produces single flowers in red while the Thai hybrid has double flowers, and both exude an intoxicating fragrance at night as an added bonus. The beautifully coloured flower clusters with pendulous trumpet-shaped blooms open first white, then turn pink and end deep pink, bright red or reddish purple over a 3-day period, displaying the various colouring stages altogether on one and the same flower stalk. Very unusual and definitely dramatic too! Its fruit is narrowly ellipsoidal, 2.5-3 cm long, with 5 sharp, longitudinal angles or wings. The 12-15mm long seeds are pentagonal (shaped like the fruit-shell) and black. 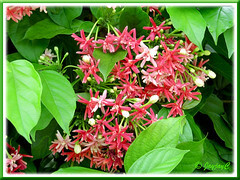 Culture (Care): Since Quisqualis indica or Rangoon Creeper is an easy to grow vining plant, it’s now more popularly and widely cultivated as an ornamental vine in the gardens. Light: Prefers full to part sun and blooms best with good sunlight. Moisture: Water moderately and regularly, keeping it evenly moist. More water during hot seasons and less in cooler clime. Fairly drought tolerant when established. Soil: Fertile humus soil with a mix of sand that can retain water, yet well-drained soil. Others: Require regular pruning to keep it within control, as well as to encourage more blooms with new branches as flowers appear on new growth. You’d observe newer shoots emerging from the base of the vine – remove them if you’d rather have one main strong stem continuing its growth at the top, otherwise leave them be to promote bushiness near its base. Require fortnightly or monthly feed with a flowering fertilizer to boost flowering. Relatively free from pests and diseases. Propagation: Easily by seeds, cuttings and layering. Suckers that emerge from the parent plant can be used to propagate new plants. 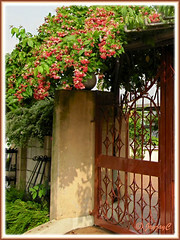 Usage: Use Rangoon Creeper or Chinese Honeysuckle to cover and decorate garden fences, trellises, arbors and arches. Can be espaliered on walls or pillars at porch/entrance to homes and buildings to add interest and provide garden fragrance too. 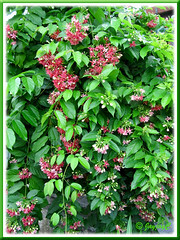 An ideal landscape vine that can be grown on ground or containers and can be trained as a shrub. An attractant for butterflies and bees, not sure about hummers though. 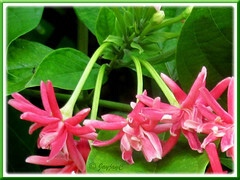 Grow in greenhouses or outdoors in the mildest subtropical regions. Quisqualis indica is used for traditional medicine in certain regions. Leaves can be used to relieve pain caused by fever while the roots to treat rheumatism. 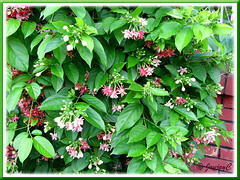 Read more at Wikipedia and Philippine Medicinal Plants on its traditional uses. A chainlink fence will be fine as long as it has a solid top rail. Not wire but pipe. It is a fabulous plant. I have one that is on an 8 ft tall pergola and it covers an area 25 ft by 15 ft. Wonderful fragrance. And tough. It has survived 4 hurricanes with two of those direct ground zero hits. Thanks for sharing further insights on this beauty, Cheryl Friend! I can just imagine how awesome your widely spread plant is…wow!! I have always loved this vine, from childhood i may say, but only two years ago managed to get a small plant which i put in a flower pot on my windowsill. Although it took two years of patient care and watering it is now flowering, tentatively. Does any one know how I can coax it into the glorious blossoms that I dream of? I have planted a Rangoon Creeper about 2.5 to 3 months back. The vegetative growth of the plant since then is nice, however, it hasnt bloomed since then. Could you advise why it doesnt bloom or if there are any specific measures I need to take? Just water, plainty of sun and a little patience. This lovely pictures transported me back to Cuba, I was a little girl and my friend and I used to make, necklesses and crowns with the flowers. Just a chainlink fence will be fine as long as it has a solid top rail. You will even get seeds out of them. Hello, I`w like to buy this plant QUISQUALIS INDICA. I really want to get some seeds becouse in my country doesn`t exist. Please let me know if you can help me…….Thank you very much!!!!!! Sorry, Anabella… we’re unable to help. I have a large Rangoon Creeper. I would be happy to provide Anabella with free seeds she would only need to pay the postage ,it shouldn’t be more than a couple of bucks if she is in the US like me. Thank you for the link to the many medicinal uses. I’ve had it for years without knowing. That’s very generous of you, Marcy. Hope Anabella drops by to follow up on your offer. As a teenager at my parents had an extensive Rangoon Creeper glowing through custard apple (called Atis in the Philippines) and Mango trees next to the house. This is in Townsville, North Queensland, Australia. I still remember the intense fragrance of its flowers. I used to open the window at night just to let in the smell. It was quite “exotic” falling asleep smelling that vine! Thanks for sharing your love of this very attractive vine with awesome flowers and fragrance, Charles. Much appreciated. My creeper flowered well after purchasing the plant. However, the flowering soon stopped and the leaves turned yellow and dropped off. The plant stands on a balcony in Chiangmai in full sun and is regularly watered. 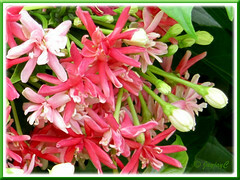 It is potted in rice husks and sandy soil. I have now cut back most of the small branches in the hope that it will stimulate new growth. Any suggestions as to what is wrong? Hi, I want to get it . Please let me know how to order them . Thank you. Sorry Doan Bul… we’re unable to assist you. Sorry Sophia, we’re unable to help you. 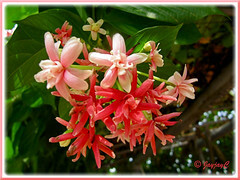 Since this beauty is native to the Philippine Islands too, you may want to source from your own country. All the best. Ow. Thank you very much! Sorry Sir… we just home gardeners and not retail sellers of garden seeds, products, etc.